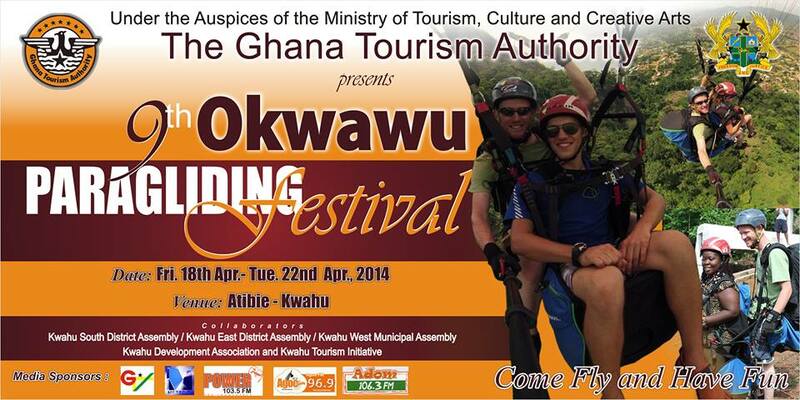 Easter tourism in Ghana is synonymous with the Ghana Tourism Authority’s annual paragliding event at Kwahu. It’s the 9th annual event! Paragliding has added to the country’s domestic tourism by enriching the local economy, generating income, reducing poverty and promoting national cohesion. It’s policy decisions like SCRAP SHORT TERM TOURIST VISAS TO GHANA that will enrich local economies throughout Ghana throughout the year and years! Enriching the local economy by employing foreign paragliders? Bang on Ian Utley-NINE YEARS and still all foreign paragliders! But let’s focus on the criticism’s of the event and not on the Ghana Tourism Authority’s official line. Ghana Tourism Authority could your over-promotion of the Paragliding event be vulgar and indeed negative? Shame on you Ghana Tourism Authority Mr. Mills deserves to be sacked if this unthought-through emphasis continues next year. Which planet is the Ghana Tourism Authority on? I have reason to believe this online presence is operated by a private entity. The Minister should come with a proper discussion paper including a proper costing of the paragliding. Ghana has been associated with gliding since the first man who flew a plane into Ghana, Captain Rattray. Hitler’s own pilot also glided in Ghana. Let us use reason and argument in our tourism promotion. Most pictures I have seen of this paragliding thing look very stupid. I believe it is a very weak, accidental idea which has been given far too much carriage than ever deserved. I blame Jake. I look forward to what he would say about his JOSEPH project in his promised book. Comments? Got a picture to back up Amos’ assertion? Sherryl Wilson posted a fabulous photo on Ghana Tourist Coach (GTC!!!) FB group site with the caption below! Chris forgive me, but I’m a bit confused. You know that I’m disappointed with the GTA (they’re not doing their job right) but I’m not quite sure what the complaints from Amos are. every year for nine years…the same ole program at Nkawkaw…no imagination..probably at a loss when you import 15 foreign paragliding pilots..billed as domestic tourism event, but at GH C 200 a flight…how many Ghanaians can afford that?